No Name Bar Stories. 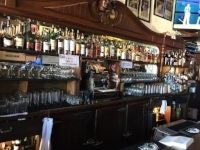 The Sausalito Historical Society invites you to a special program at the Sausalito Library celebrating the "wonder years" of the No Name Bar from 1959-1975. The event on Friday, May 11 at 7:00 p.m. will feature a welcome from Neil Davis, former owner of the No Name Bar, and stories from bar patrons and staff. Speakers will include Greg Baker, Margo St. James, George McDonald, Steve McNamara, Michael Stepanian, Ian Swift, and Dana Upton. The program will be followed by the grand opening of "No Name Bar: The Wonder Years 1959-1974" in the Exhibit Room of the Sausalito Historical Society. The exhibit will feature photos and memorabilia from the No Name Bar. Neil Davis in March 2018 documented the how he inherited the "No Name" bar in Sausalito.